Vive Bastille Day! Vive Chez Panisse! It seems impossible that we are already deep into July, where does the time go? 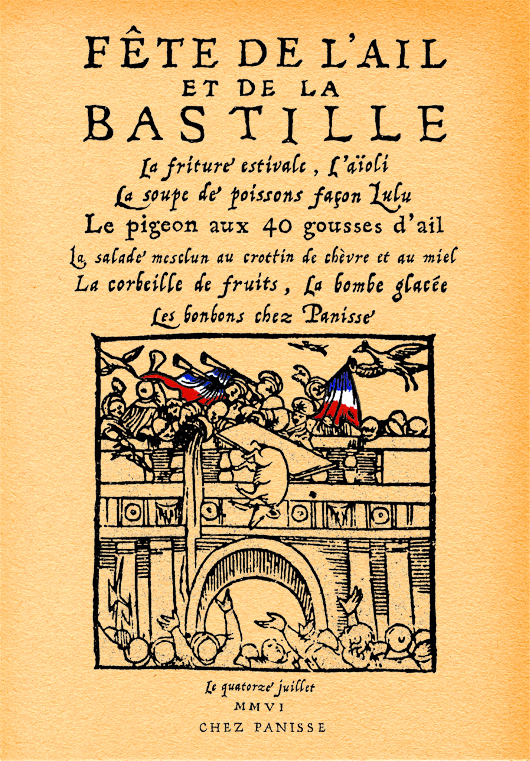 Although I’m a little late, I thought I’d post another one of my Bastille Day menus designed for Chez Panisse Restaurant. I’ve created many special menus for Chez Panisse over the years and they continue to be some of my favorite projects of my career. Alice (the owner and guiding light of the restaurant) found this festive image in an old book of hers, it felt perfect for a delicious celebration of Bastille Day. My hand-lettering of the menu was inspired by beautiful old typefaces from the 1500-1700s and I found a gorgeous ream of vintage paper to print onto (the warm patina on the edges of the paper is so appealing to me!). I put on some playful French music by the Baguette Quartette and proceeded to hand-paint each French flag. Vive la France! Vive Chez Panisse!